This was a big show. 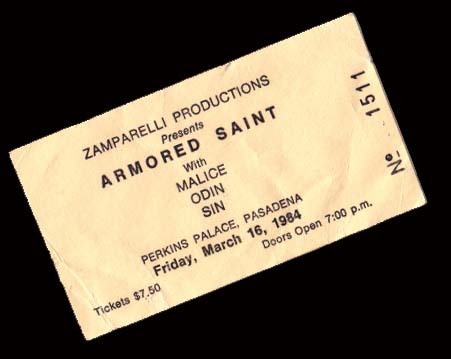 Not only because the bill was loaded with four of L.A.’s hottest local bands (Malice, Odin, Sin, and of course Armored Saint), but also because it was Armored Saint’s first gig as a major label band with an LP in the can. 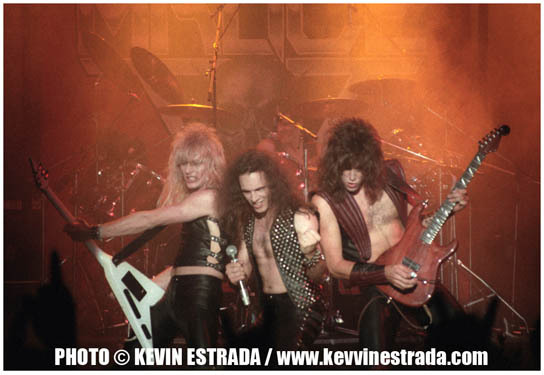 The band had been in the studio making their debut full-length LP for Chrysalis Records, so it was many months since Armored Saint had been on stage. They were buzzing – big time. The word was that they were about to be the next big thing out of L.A., and they should have been. This was a huge homecoming for the band and their fans. 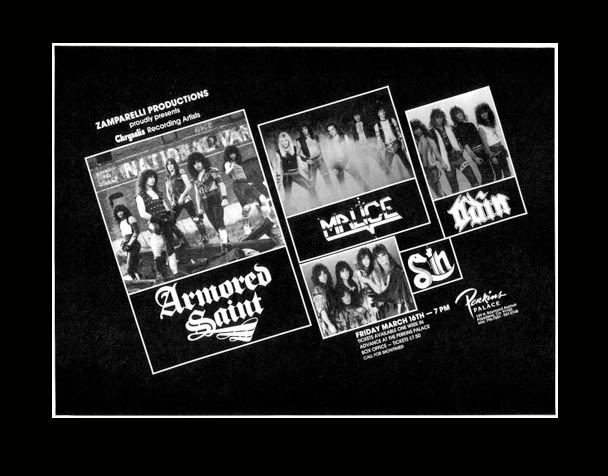 Armored Saint really wanted to make this an event and have this show stand out. They put together a very elaborate opening. 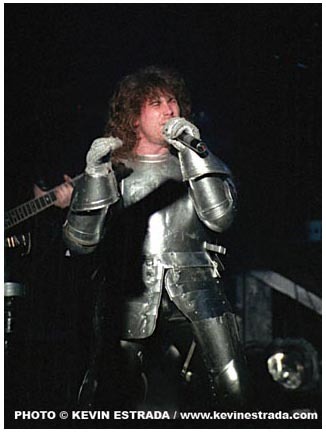 As the band ripped into March Of The Saint, John Bush came cruising out wearing an entire suit of armor. It looked spectacular. I was so captivated by this stunt that I nearly shot off all of my film right away. Bush could hardly walk in that suit, but he tried his best. Not even one full song into the set, he had to climb out. I was never sure if it was because he was having difficulty walking or if it was the heat inside. Regardless, their once of a lifetime intro sure paid off, at least for my friends and me. This photo holds a very special spot in my heart, as a fan of Armored Saint and as a fan of hard music. It was one of the best shows I ever attended as a teen. 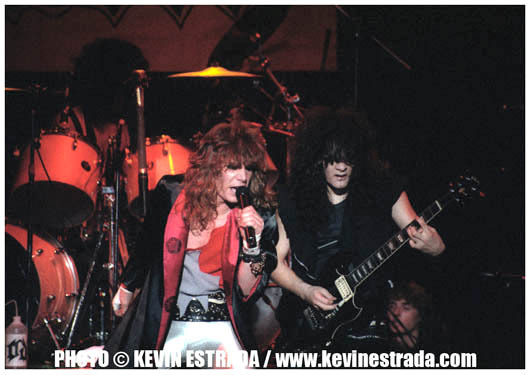 I smuggled my camera in that night – taped to my back, and I am pretty sure my friend Erik smuggled my lens in for me in his massive metal hair-do. I had my system down for shooting at Perkin’s Palace. We would get there early and my buddy Andy would rush in and grab a few seat in the first 5 or 6 rows. Once the show started, I would stand on the arms of the chairs (they had those old movie theatre style seats) so I could be a bit above the heads in front of me. My best-friend Rob (who was also recording the shows) would keep an eye out for security and subtly lean against me to keep me balanced. I would pop up and down, snapping away when the guards weren’t looking. I could never use a flash, that would be a dead give-away that I was snapping photos from the seat, so I could only shoot when the light was just right on the stage. This is how I really learned to read light and to master working a camera manually. Photographed with my trusty, smuggled in Canon AE1 Program and a cheap, no name 70mm-210mm f5.6 lens. Shot on Kodak Negative Film.